Mariko Oshiro is not your average Tokyo cop. As the only female detective in the city’s most elite police unit, she has to fight for every ounce of respect, especially from her new boss. While she wants to track down a rumored cocaine shipment, he gives her the least promising case possible. But the case—the attempted theft of an old samurai sword—proves more dangerous than anyone on the force could have imagined. 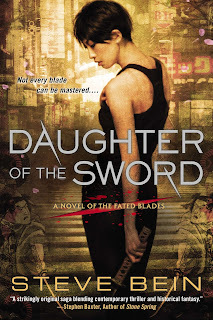 Daughter of the Sword is a unique read, a combination of the paranormal and a police procedural. Bein weaves the main story of a female cop in Tokyo's elite police force hunting down a killer while learning about a mysterious katana with stories from ancient Japan about a trio of cursed swords. I don't even know where to start for this review - there was so much to this book! The main story of the book was intriguing and even though we know who the killer is I was totally sucked into the hunt for him. Mariko is a likable heroine, although different from those I usually read. She is tough and desperately trying to keep hold on her position on the Tokyo police force. In Japan, women are still not considered quite equal when it comes to doing jobs originally meant for men. Mariko battles a misogynistic lieutenant and the boys' club to gain some respect at her job, but she's very smart and a good detective so I got very angry every time she had to deal with the sexism. Professor Yamada was a nice addition to Mariko's story. He is the gentle, elderly professor who doubles as a samurai sword master. He serves as Mariko's teacher of all things katana and he also has a specific connection to the killer she is tracking. He also possesses one of the 'fated blades' and I enjoyed learning about his sword in the mini stories that focused on the one he now owns (more on that in a minute). It was really interesting to reads the parts of the story like this that showed current Japanese culture. So many things about their culture is similar to ours that we often forgot how very different the country is from the US. I was really intrigued by these differences and learning about Japan was part of the draw of this story for me. Even more intriguing were all of the mini stories woven into the book. These told the stories of the three cursed swords throughout ancient Japan and World War II. I was even more sucked into these tales. They were so absorbing and really made some of the aspects of the main story make sense. Bein's writing is totally seamless as he switches from a modern day murder mystery to the hills and rice flats of hundreds of years ago. Each sword's 'curse', or blessing depending on the sword, was creative and fascinating. In the end, all the stories came together nicely and I was more than satisfied. I'll be interested to see where the next in this series goes; if it will follow Mariko or get a whole new story. Recommended for fans of: Japanese culture, stories told in multiple time spans, police procedurals, katanas, katanas, katanas.